Offering duplex & multiplex paper gluing service to commercial & hobby letterpress printers. 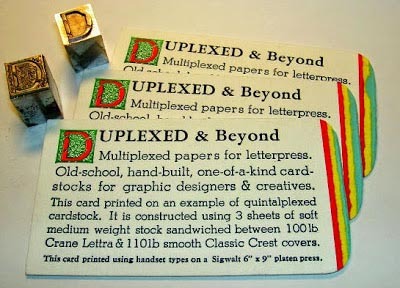 Over 40 years letterpress experience and 15 years using bookbinding glues & machines will bring a sensitivity to your duplex or multiplex project unmatched in the letterpress community. We can glue any stock from 20# text up. Even fabrics to cardstock. In any quantity. Please do not hesitate to e-mail or call with any questions.